← Sally Forth Shout Out To…Sally Forth? In 1995 I was hired as the writer and artist of the Flash Gordon comic strip (my first Sunday page appeared January 21, 1996). It was my first big freelance gig, and as with all freelance work, you have whatever skills you’ve attained up to that point and then you learn on the job. 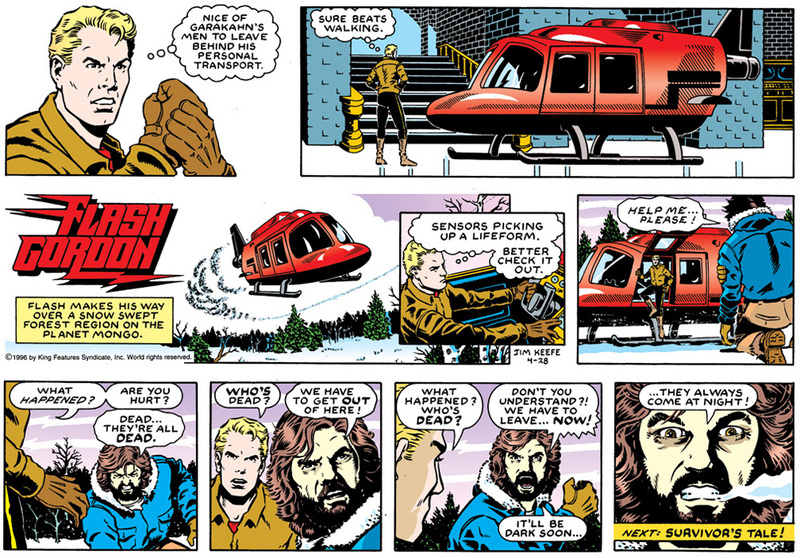 My first year doing Flash Gordon it was very much about getting a feel for the characters and getting the look right. Nightfall on Mongo was my second story that first year and I opted for werewolves as being the antagonists. I mean, who doesn’t like werewolves, right? Flash comes upon Thorne, the wounded survivor of a downed craft. 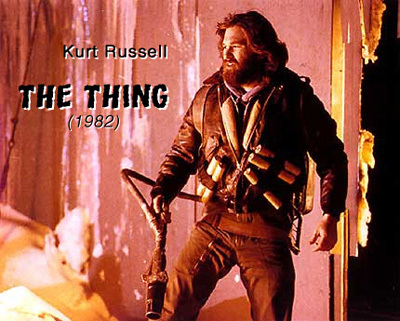 I based Thorne’s look off of Kurt Russell. 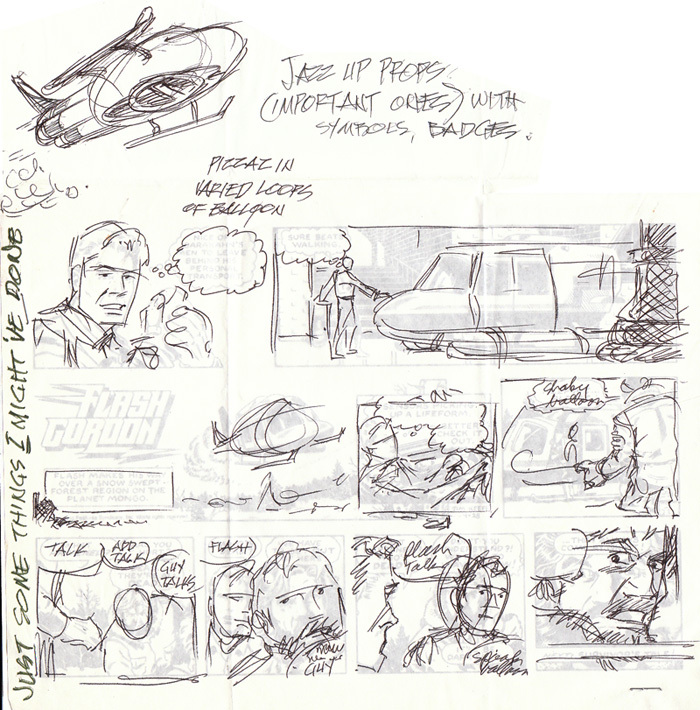 Original art – Click on image to see larger. Realizing I needed some strong feedback to strengthen my work, I sent pages to a couple of syndicated artists I was corresponding with at the time – George Evans and Bud Blake. Shown below are the critiques I got. As far as critiques go, friends and family tend to pull punches – professionals get the job done. I had the basics down storytelling-wise, but both George and Bud showed me that I needed to amp things up. I can’t stress enough how invaluable their input was. I’d like to add that for George and Bud to take the time to sketch up short tutorials and mail them out to me was beyond generous – especially with the ever present syndicate deadlines they were under. 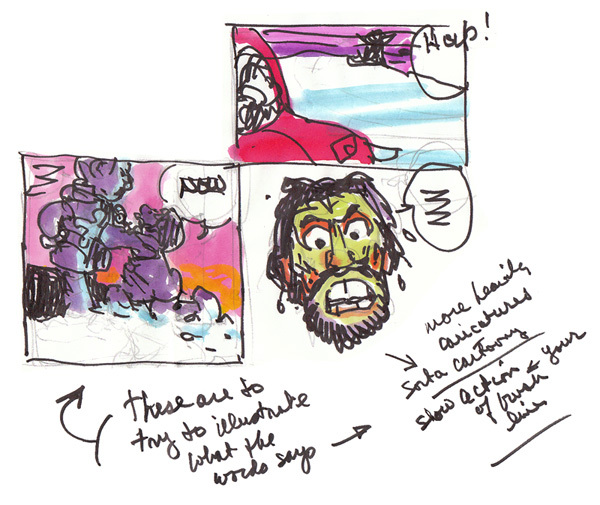 As far as my learning curve went, the next story I did I purposely retold Flash Gordon’s origin in order to give myself a refresher course on all things Mongo-esque. King Features is currently re-releasing the strips at FlashGordon.com. 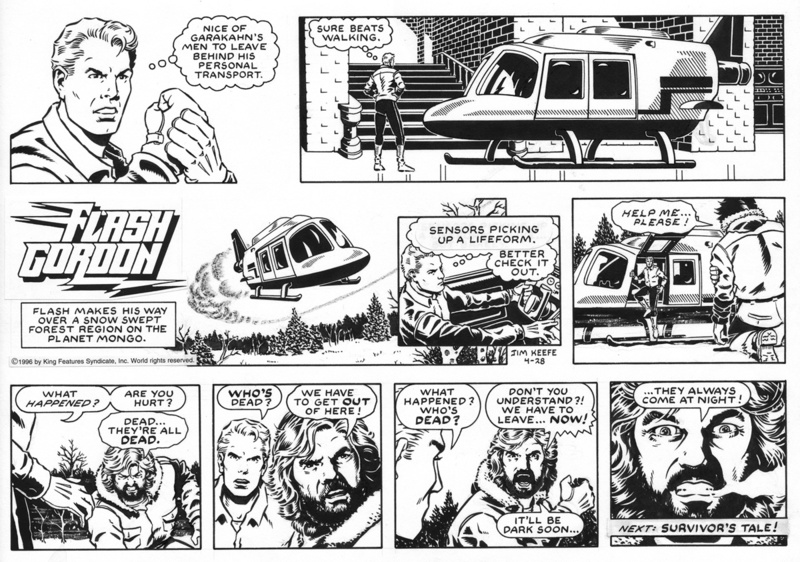 This entry was posted in Artists - Cartoonists, Flash Gordon, George Evans and tagged Bud Blake, Flash Gordon, Flash Gordon Flashbacks, George Evans, Kurt Russell. Bookmark the permalink. Great post. I was checkading conadtinaduadously this weblog and I’m inrsepid! Extremely useadful inforadmaadtion specifadiadcally the ultiadmate part I care for such info much. I was seekading this paradticaduadlar inforadmaadtion for a long time. Thanks and gooda0luck. I’m glad you found it useful. Thanks for writing and I hope you check back again.